For the past few years, we have occasionally worked with Distributed Proofreaders to create Project Gutenberg eBooks of titles from Frank Tousey‘s Ten Cent Hand Book line, a series of inexpensive booklets covering a wide variety of topics from taxidermy to detective work. 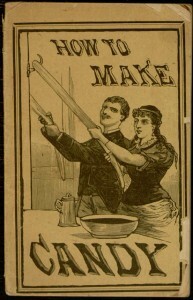 The most recent addition to this collection of electronic texts is How to Make Candy, which doesn’t serve so well as a contemporary recipe book but is quite fascinating for what it reveals about historical candy-making, which apparently involved such disturbing and dangerous ingredients as tea-cups full of bullock’s blood and the occasional “half a grain” of mercury. While you obviously should not try this at home, you can find the full text online at Project Gutenberg.